Grab yourself a cup of coffee and get ready to be inspired. It's Friday and the party starts HERE! Lately it's been looking like this. 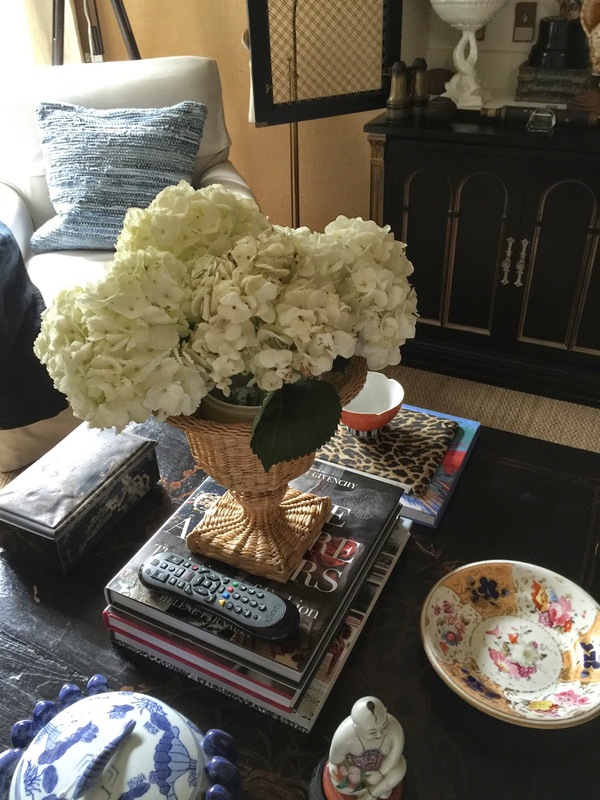 My favorite flowers to display in this room are hydrangeas and I like to arrange them in all sorts of fun containers that I find during my treasure hunts. 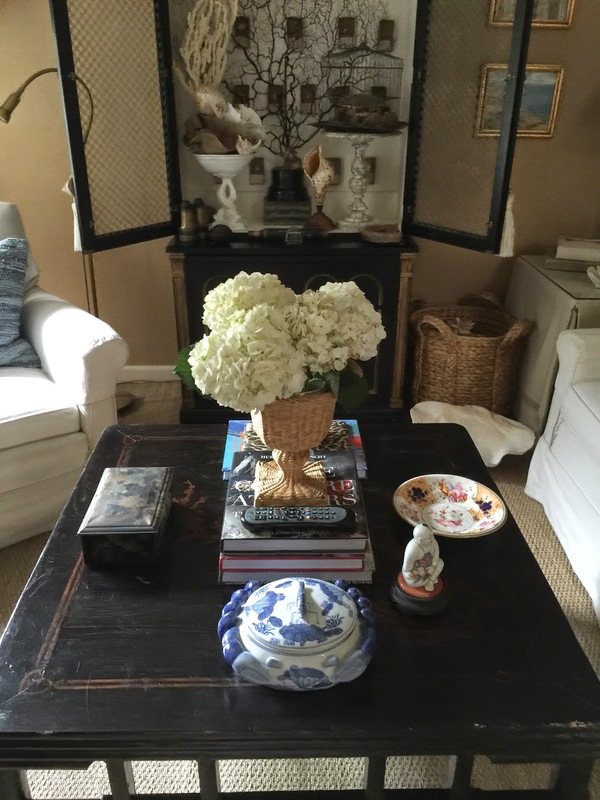 The coffee table is a great destination for a lot of my unique finds and I like to change things up often. 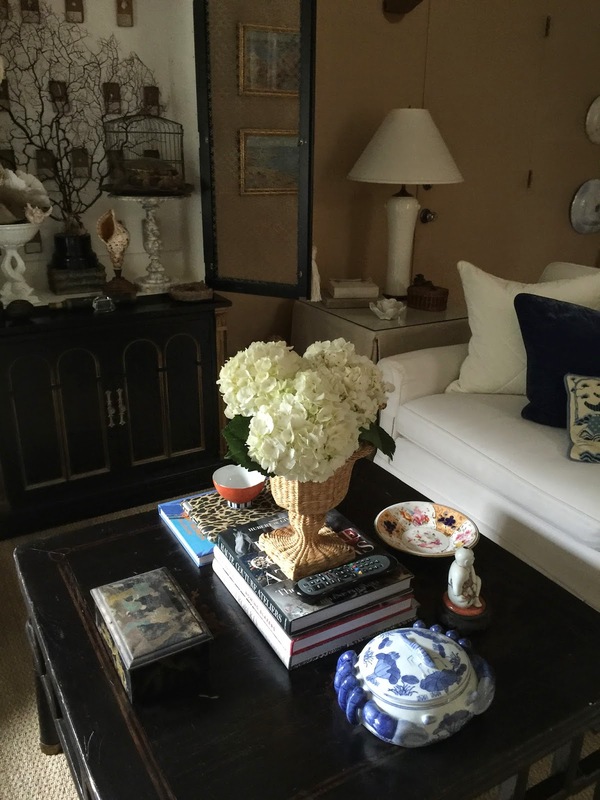 It's a no-brainer to anchor a vignette with a stack of books. 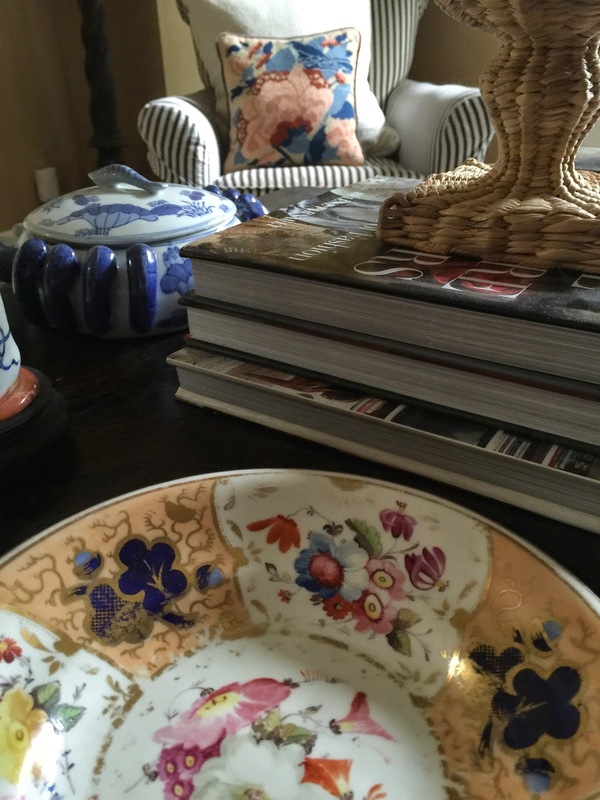 My eye likes things to flow with the rest of the space so I often end up choosing accessories that complement what else in happening in the room. 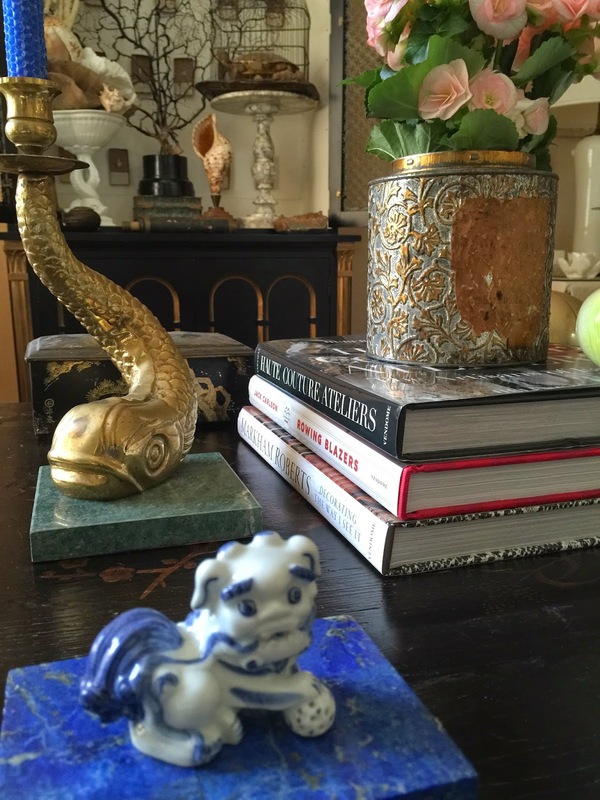 I have a love of Chinoiserie consequently many of the colors found in Asian Decorative Arts end up in my vignettes. A little bit of leopard never hurts. I love how all these colors and patterns play off each other. 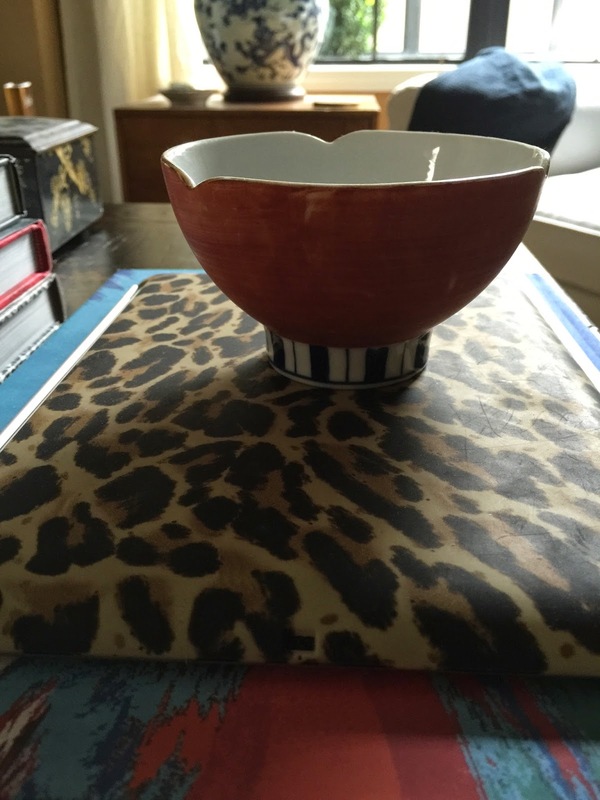 I find that many times when I'm thrifting I tend to gather things that relate to each other and so I think that translates to my vignettes. 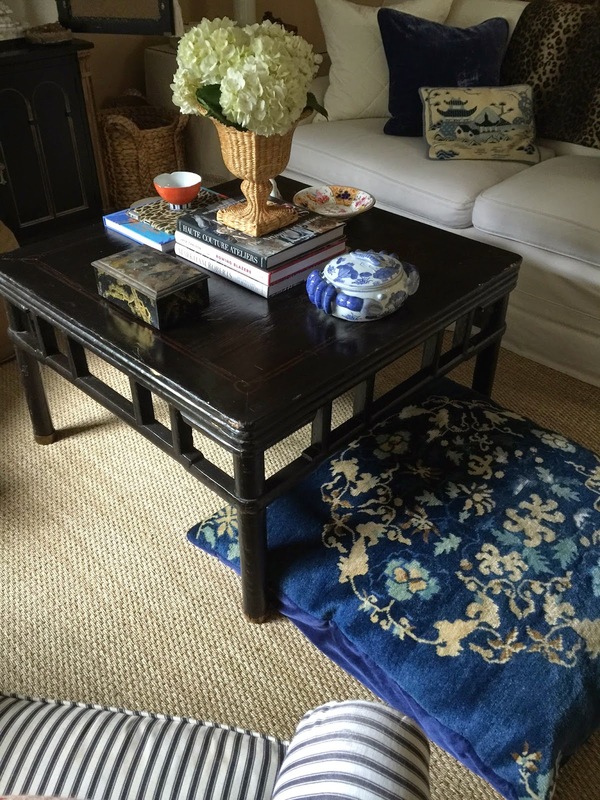 I recently found a large floor cushion that was made from an antique Chinese carpet. It dawned on me that it just might fit perfectly underneath my coffee table so I took a risk and bought it. Sure enough it fit perfectly and now resides underneath the coffee table. It has become a favorite of my husband who loves to pull it out at night and use it as a sort of footstool when he's watching TV. I consider it part of the vignette as it plays beautifully off of the other Asian accents going on in the room and on top of the coffee table! Thank you Mary Ann and Cindy for hosting this fun and informative Design Challenge! Be sure and visit these other lovely bloggers who are sure to impress! 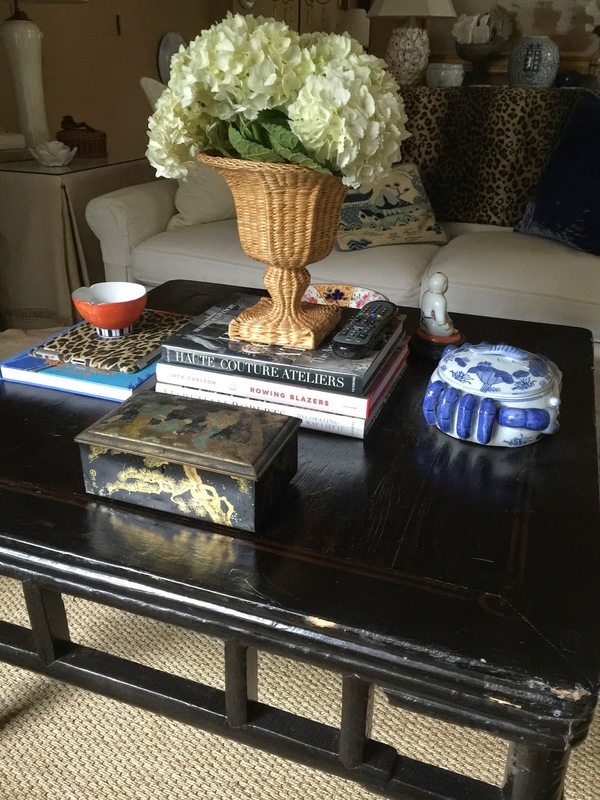 I love this old asian table its great and the eclectic styling is perfect for it! It's fun seeing all the different scenarios. That floor pillow is pretty amazing! That's a beautiful table. What a great find! 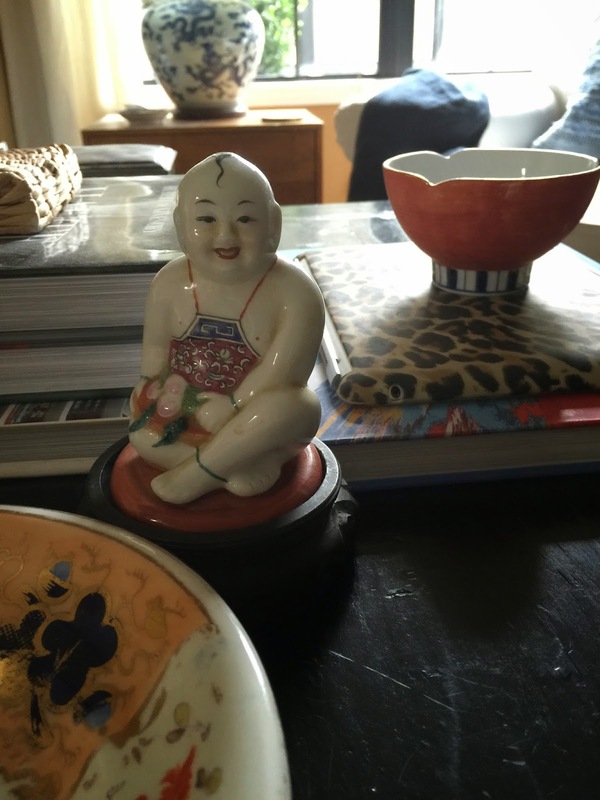 Terri well you know I love anything Asian and your table and artful accessories look fabulous!! The finds all go together wonderfully! Adore your home!! You are so good at finding just the most interesting objects with meaning (and of course you know all their history, etc). I love that you called it "playing" with your friend...that's how I feel. It should be fun! Thanks for playing with us! Love, love, love your choices here! 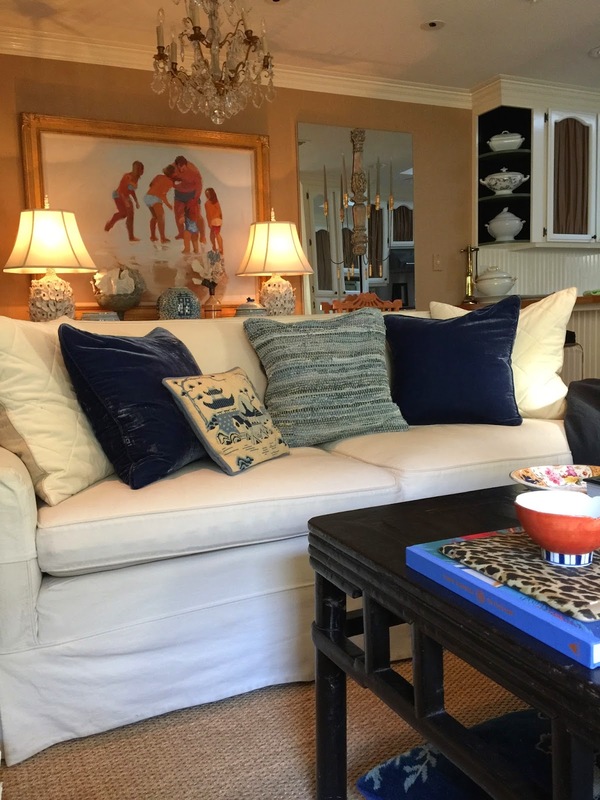 And I would KILL for that floor pillow and that pair of koi/dolphin candlesticks....I have searched antique malls, thrift stores & ebay for an affordable pair...no luck yet but I am determined. Truly inspiring work! Thank you! Oh my goodness! Let's see I want that table and almost everything on it. You have such an incredible eye. Can I just say wow! I didn't think the second could possibly be better than the first but the addition of that blue! I want to come back and study it when I have more time! Cindy - no need to study my post when you can come over and see it in person! Let's get a date on the calendar!! I almost invited both you and Mary Ann to come over and help me as I get easily overwhelmed with my treasure trove! 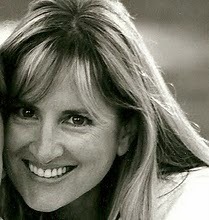 Thanks again for including me with the other lovely bloggers... it's been a lot of fun! Love the candlesticks and your blue and white. That bowl of agates....fabulous! Now, I have to get a leopard Ipad cover! Great job! Stunning...each and every one. 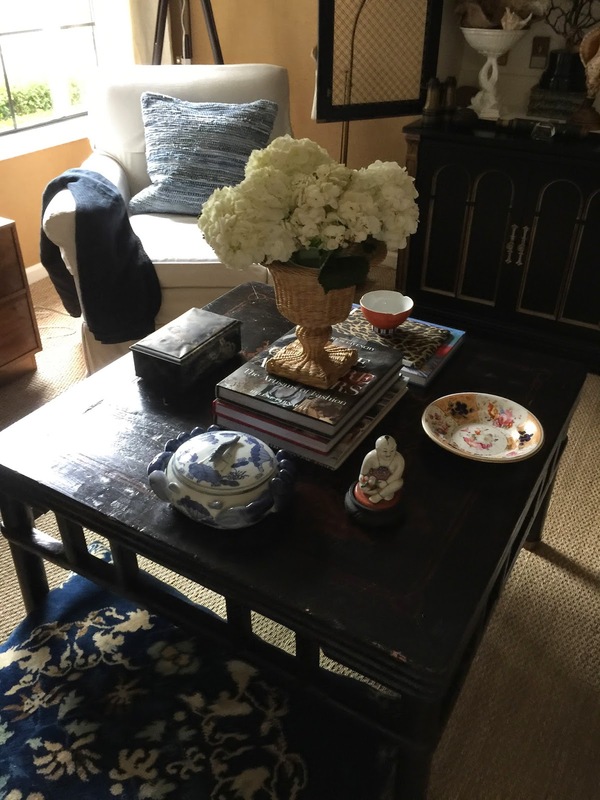 I love the black coffee table, its so dramatic and everything looks beautiful on it. Such a fun concept..have a great weekend! fun, fun, fun. 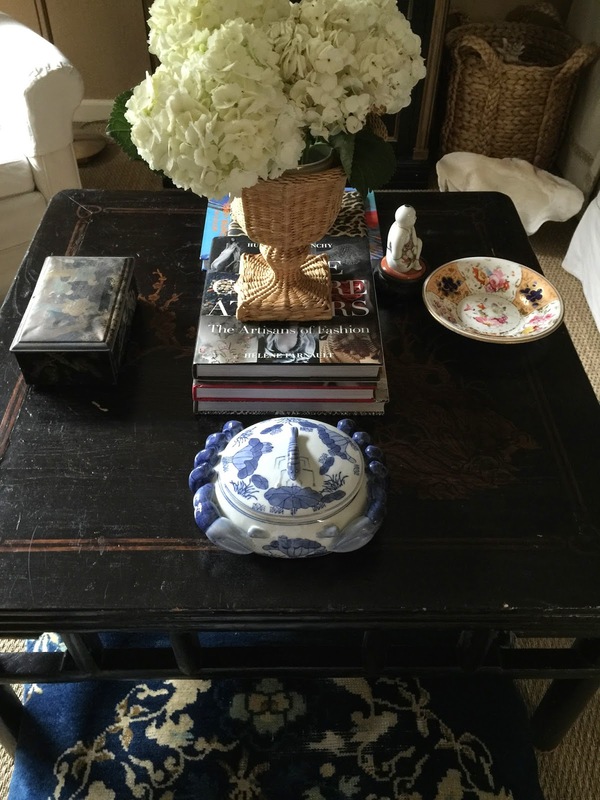 Love the new addition of indigo in your room and it is pairing so beautifully with all of your treasures. 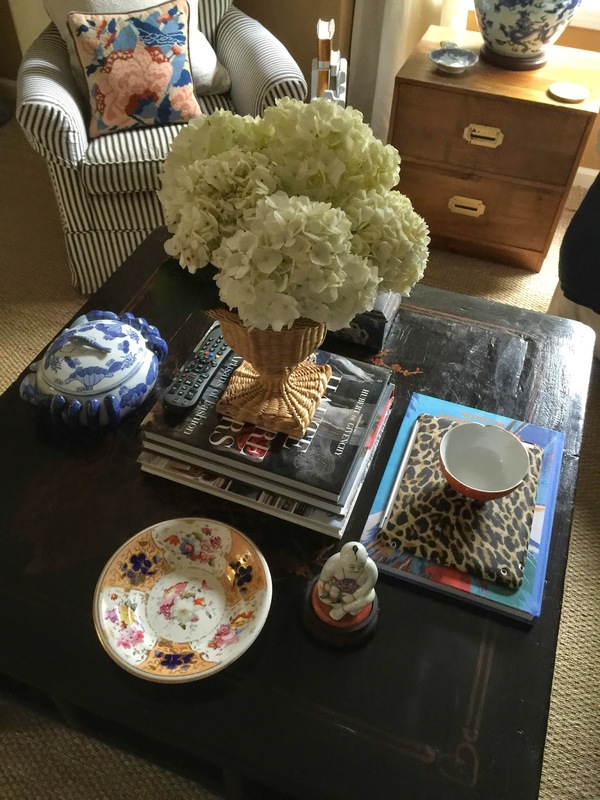 I found myself shopping your coffee table vignettes, so much eye candy!!! Beautiful! I love how all the vignettes connect with the decor in your family room. 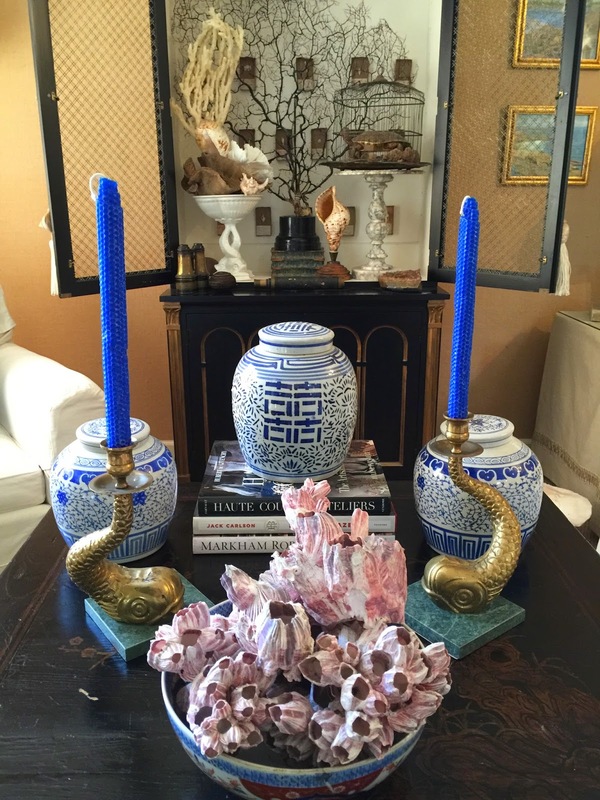 Love those bold blue candles and that fish looks like he's swimming on your table, really great look. 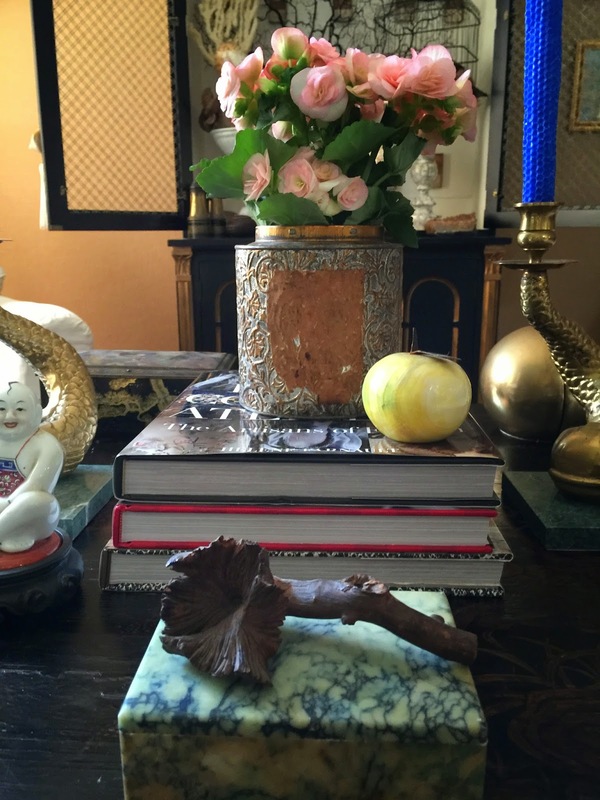 I love your mix of unusual objects and the pops of color. That is a great table. Well dang! It helps to have SO MANY gorgeous things to work with! Starting with that awesome coffee table which is to die for! 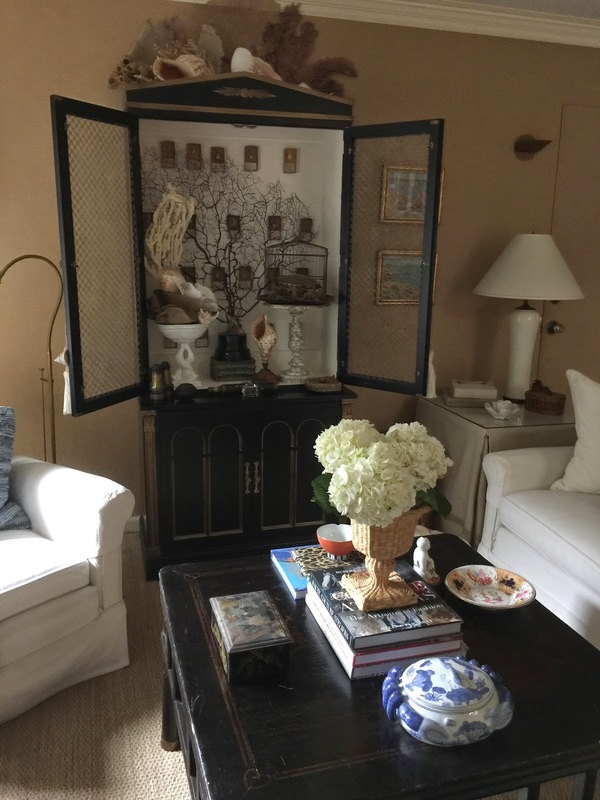 Love the mix of everything old and of course adding in some shells is perfect! Love those royal blue beeswax candles! Well, those DOLPHIN candlesticks were a SCORE!!!!!!! 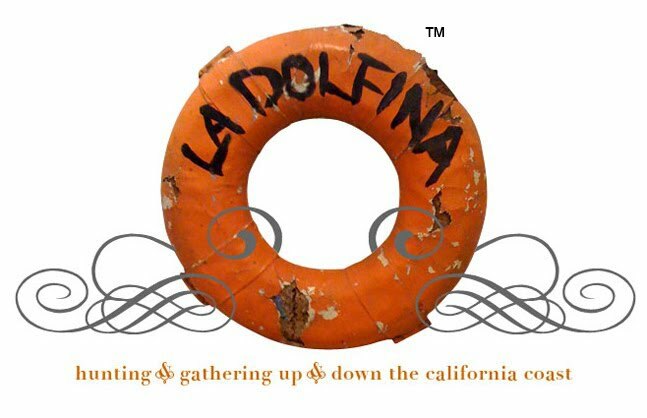 Very fun and I adore the dolphin candlesticks. 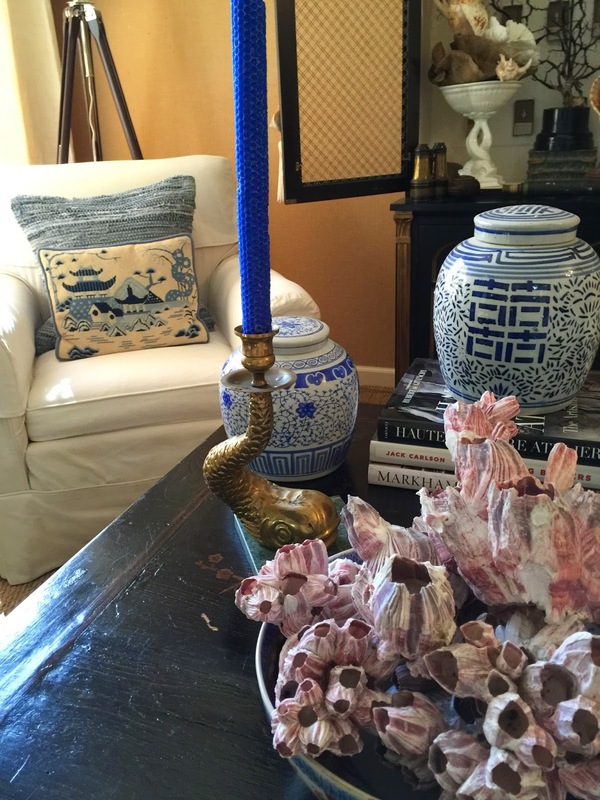 Perfect mix of brass in your vignette! Lovely! This was n interesting post. I love all your accessory's. Love Chinese in all forms food too. 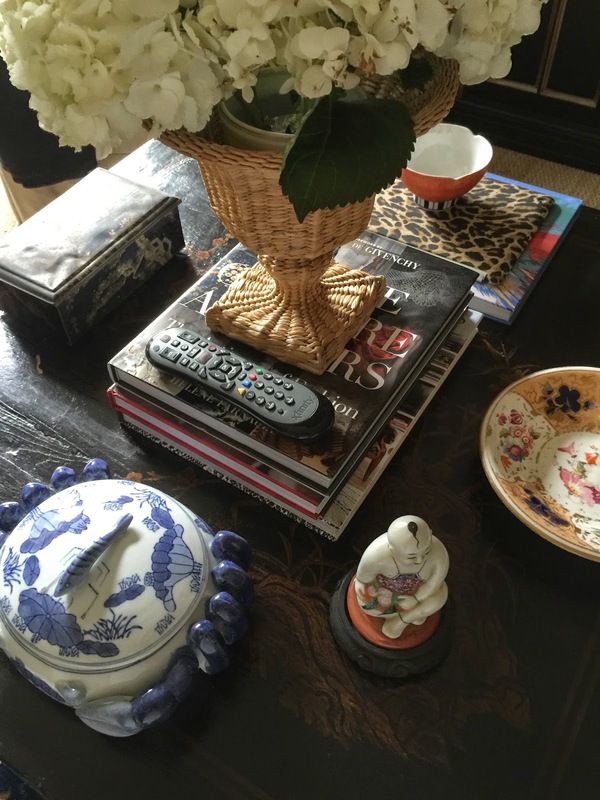 No matter how you style it, your coffee table and your home always look smashing! !